JULY 6, 2013. LOUIS LIVES. AND WE FEEL IT DEEPLY. This story begins in a sweetly undramatic way. The Beloved and I had spent the afternoon of July 6 doing a variety of errands in the car. We had some time before we had to return home, so she suggested that we do a short bout of “thrifting” (visiting our favorite thrift stores) in the nearby town of San Rafael, California. She favors a hospice thrift place called HODGE PODGE; I opt for GOODWILL, which is half a block away. Once in Goodwill, I looked quickly at men’s clothing and took two items off the rack for more consideration. 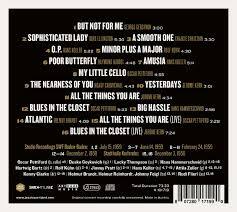 I saw there were many records in the usual corner, perhaps three hundred LPs and a half-dozen 78 albums. Just as I write the novella of the life of the person ahead of me on line in the grocery store by the items (s)he is buying, I create the brief biography of a record collector by what patterns there are. Admittedly, the collection I perused was not solely the expression of one person’s taste, but it seemed a particularly deep 1959 collection: original cast, Sinatra, Dino, Hank Williams, comedy, unusual albums I had not seen before. In about ten minutes, I found a Jack Lemmon record on Epic, where he sings and plays songs from SOME LIKE IT HOT (he was quite a good pianist), the orchestra directed by Marion Evans. (Particularly relevant because I am also finishing the 1999 book, CONVERSATIONS WITH WILDER — that’s Billy — and enjoying it greatly). A Murray McEachern mood-music session for Capitol, CARESS, with Jimmy Rowles; the somewhat dubious JAZZ: SOUTH PACIFIC, with Pettiford, McGhee, J.J. Johnson, Rudy Williams; Ethel Waters doing spirituals and hymns on Word; Clancy Hayes with the Salty Dogs — Jim Dapogny on second cornet / valve-trombone, Kim Cusack on clarinet — OH BY JINGO on Delmark. Then I moved to the 78s. I thought about but did not take a Black and White album of six songs by Lena Horne with Phil Moore, but took without hesitation a Capitol collection of Nellie Lutcher, because Sidney Catlett was on a few sides, I think. More than a few minutes had passed. My knees were beginning to hurt and other people, one with a well-behaved dog, had been drawn to the trove. The last album I looked at was an unmarked four-record 78 album. The first sleeve was empty. The second one held a Fifties TOPS record “Four Hits On One Record,” which I disdained. 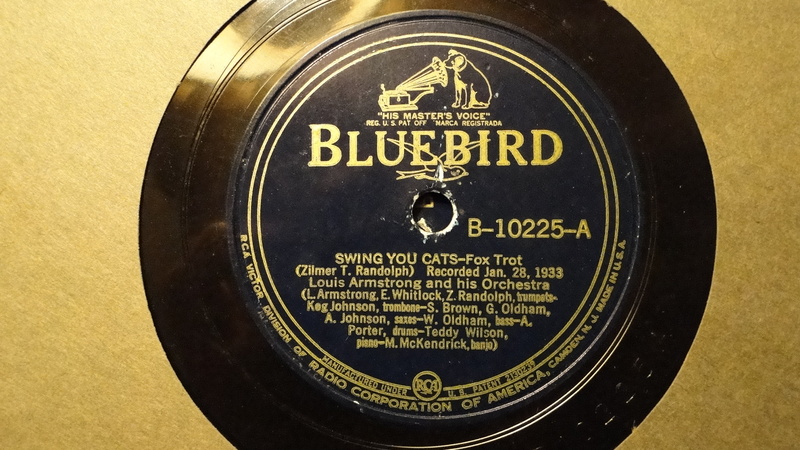 The third was a prize — a late-Thirties Bluebird of Fats Waller and his Rhythm doing AIN’T MISBEHAVIN’ (“Recorded in Europe”) and GEORGIA ROCKIN’ CHAIR, which pleased me a great deal. It would have been the great treasure of my quest. I turned to the last record and caught my breath. I know this feeling well — surprise, astonishment, intense emotion — the equivalent of a painless punch in the solar plexus. I’ve felt it other times before — once a year ago in California with a Bluebird 78 in a Goodwill (take that confluence as you will) which I have chronicled here. This record was another late-Thirties Bluebird, this one by Louis. One side was Hoagy Carmichael’s SNOWBALL (which made me smile — it’s a great sweet song). For nearly a decade my email address has been swingyoucats@gmail.com. Initially, I took it as a self-definition and an online “alias” because those three words are to me a collective exaltation — “Hallelujah, Brothers and Sisters!” in a swinging four – four. But “Swing you cats!” is not only exhortation — “Let’s unite for our common joyous purpose!” but celebration that we are communally on the same delighted path. And then it dawned on me. Choked up, I eventually said, “This is the anniversary of Louis’ death. July 6, 1971.” After a long, tear-stifled interval during which we simply looked at each other and the record, I took my treasures to the cashier, paid, and we went home. To describe my feelings about this incident, I run the risk of characterizing myself as one of the Anointed and elaborating on this fantasy vision, where Louis, in the ethereal sphere, sees what I do in his name and approves — sending a little token of his approval my way. I know that some readers might scoff, “Please! That record was a manufactured object. Thousands of copies were made. It was simple luck that you got it. Do you think Louis — dead for forty-plus years — would know or care what your email address is?” I can certainly understand their realistic scorn. But since I am sure that the Dead Know — that they aren’t Dead in any way except the abandoning of their bodies, who is to say that my taking this as an affirmation from Somewhere is so odd? How many of us, for whatever reason, have felt the presence of someone we love / who loved us, even though that person is now “dead”? So I felt, in a more intense way, connected to Louis Armstrong. That is not a bad thing. And I could hilariously imagine the way I might have popped up on one of his letters or home tapes. 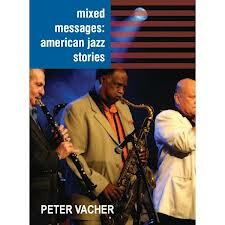 I hope all my JAZZ LIVES readers, cats indeed, will happily swing on now and eternally. I send them all my love. For those who want to know more about this record, read and hear my man Ricky Riccardi’s essay on SWING YOU CATS, here. *I have witnessed much high-intensity irritation on Facebook directed at people like myself who make YouTube videos of a spinning vintage record without using the finest equipment. I apologize in advance to anyone who might be offended by my efforts. SWING YOU CATS sounds “pretty good” to me. And my intermittent YouTube videos — the “JAZZ LIVES” DANCE PARTY — will offer 78 sides that aren’t on YouTube. Just for a thrill. ROSES OF PICARDY was a famous ballad of the First World War, composed by Frederic Weatherly (lyrics) and Haydn Wood (music), gracefully describing the lasting love of an Englishman and a Frenchwoman . . .
Verse: She is watching by the poplars, / Colinette with the sea-blue eyes, / She is watching and longing, and waiting / Where the long white roadway lies, / And a song stirs in the silence, / As the wind in the boughs above, / She listens and starts and trembles, / ‘Tis the first little song of love. Chorus: Roses are shining in Picardy, / In the hush of the silver dew, / Roses are flow’ring in Picardy, / But there’s never a rose like you! / And the roses will die with the summertime, / And our roads may be far apart, / But there’s one rose that dies not in Picardy, / ‘Tis the rose that I keep in my heart. 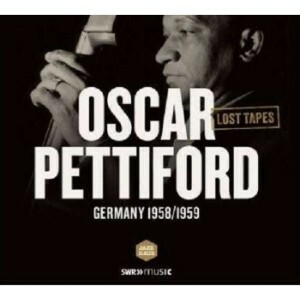 But my subject is a recording of PICARDY by Red Nichols — full of surprises. I first encountered the Nichols records of this period when I was young; I was especially intrigued by them because of my childhood affection for the film THE FIVE PENNIES. My local suburban librarian was hip: the library’s holdings included Vic Dickenson, Jimmy Rushing, THE SOUND OF JAZZ, Ellington, and a Brunswick reissue of Nichols circa 1927-30, where I first heard IDA, AVALON, CHINA BOY, THE SHEIK, and others. I hadn’t heard ROSES OF PICARDY until my recent purchase of the very gratifying sets of the Nichols Brunswicks (1926-32) on the Jazz Oracle label. It became one of those essential recordings for me — one that I could play ten times in a row on the way to work. But ROSES OF PICARDY had a sentimental identification, and I wonder if Nichols’ “jazzing” it struck some older listeners as heretical: “That’s not the way to play that pretty song!” It might serve as a reminder that improvisation, no matter how established and safe it seems to our ears now, always sounds radical to some listeners. This version was recorded on February 16, 1929, as the fifth performance of a date where the musicians had already completed two takes apiece of ALICE BLUE GOWN and ALLAH’S HOLIDAY. I wonder if they had some time left at the conclusion and decided to create a head arrangement — somewhat less complex than the Glenn Miller charts for the preceding songs. The personnel for the first four songs was Nichols, Mannie Klein, Miller, Dudley Fosdick, Jimmy Dorsey, Fud Livingston, Adrian Rollini, Arthur Schutt, Carl Kress, and an unidentified drummer. I hear a smaller group on PICARDY and we know for sure that Miller was not present, but whether there was a second trumpet is not certain. The band charges into the song, Nichols presenting the melody in a clear, assertive way — more like a wonderfully adept cornetist at a band concert than a hot jazz player leaving the melody behind. One hears the dry slap of the drummer’s wire brushes, the sound of the bass saxophone (could it be anyone except Rollini?). Apparently there is a high-pitched trombone playing staccato phrases and a thin but graceful clarinet line. I take it on faith that there is a pianist (I do not hear a guitar) but the former is simply laying down the plain harmonies in support. I also notice that the band — in subtle opposition to Nichols’ chosen tempo or perhaps simply finding a better groove — gently slows down as it proceeds through the two minutes and thirty-one seconds. (The piano-drum duet in the first half of the final chorus is especially leisurely.) I would not have noticed this so much had I not played the recording over and over and heard that the opening chorus was taken at a much brighter tempo than the closing. The first chorus is very satisfying: one could use it is a compact example of simple melodic embellishment (in terms of ornamented melody) and neat ensemble playing. Just as a listener might be settling into complacency, Rollini leaps in with a break, a marvel in itself. One could point to its simplicity — arpeggios and repeated notes — but the combination of grace and ferocity is delightful. It also suggests the small devices that Nichols and his contemporaries set up for variety, so that a recording was more than four or five choruses of ensemble – solo – ensemble. The first half of the second chorus is given over to another embellished improvisation on the theme — by a brass player over a slightly ornate piano, bass saxophone, and drums. On first hearing, one automatically assumes “trombone in the Miff Mole style, staccato yet elegant,” but the range is somewhat higher, the tone lighter. The player’s approach is close to Nichols’ opening exposition, yet the second solo is slightly more fluid, punctuated by the pianist’s upward arpeggios. In the second half of this chorus, we hear Jimmy Dorsey on alto saxophone over an even lighter background. For some reason, there is no bass saxophone, so the texture is much lighter — and, listening closely, one has the delightful sensation of expectations being reversed. Instead of textures becoming more rich, volume and density increasing, we are hearing the instruments of the orchestra — Papa Haydn in Hot — taking a break, leaving the stand. The Incredible Shrinking Orchestra! And then someone takes another break — with key change — to lead us into a world of even more playful marvels. We’ve just heard the sonorities of Dorsey’s alto (the rich yet light sound that other players delighted in) — what is this squeaky thing that follows? It might be a clarinet — Nichols often employed Pee Wee Russell and Fud Livingston, both of whom departed from orthodox clarinet sound in favor of explorations — but it sounds stranger than strange, even a bit elementary. Did someone’s kid brother or sister bring a student model clarinet into the session to sit in for a chorus? The ear is first mystified, then delighted. And for a moment it seems as if all the other musicians have fled, leaving only the unusual reed player and the pianist, chiming behind perfectly, the drummer, hitting a cymbal (this has been worked out, one senses in retrospect) in front of the microphones. Bass saxophone, alto, possibly other reeds, cornet and other brass — everyone’s in the alley next to the Brunswick studios taking a break, trading gossip or lighting up. But no. The third chorus is given over to a duet for two instruments that sound almost familiar — trombone and clarinet, we assume — for sixteen bars. For forty seconds — a short interlude in anyone’s lifespan but a substantial part of this 78 RPM recording — these two instruments cavort deliciously. The “trombone” continues an ornamented exploration of PICARDY — in case listeners might have been led so far astray by the uncontrollable impulses of Reckless Jazz to forget where land is — as the “clarinet” dances overhead. That “clarinet” has an oddly choked sound and a small range, so the player contents himself with deeply swinging emphases, rather like a speaker who has a small vocabulary but is vigorously concerned that the audience miss the point: here it is, and here it is again — getting somewhat more adventurous as the chorus continues, even venturing a series of upward plaintive phrases, the “trombone” sounded muffled but still agile beneath. On my first hearing, driving to work as I was, I couldn’t check the personnel listings, but I played this exuberantly odd interlude over and over, thinking, “Is that Fud on clarinet and Miff on trombone?” But I felt as if something otherworldly was taking place: had I been transported to an alternative realm, or was this soundtrack music for a pre-FANTASIA fantasia, where an animated lemur hopped around with a giraffe? Before we have sufficient time to consider all these mysteries, the opening ensemble reasserts itself for a closing sixteen bars. No tags, no flourishes, everything is as it was. We awake from young Robin Molyneux’s dream — did those forty seconds happen? Are we back in a Red Nichols session at the Brunswick studios? 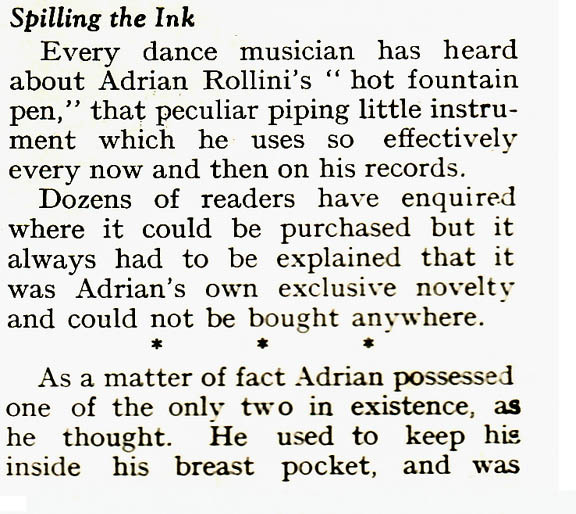 Happily, the mystery I have encouraged here has tangible answers, and they take the shape of the ever-inventive Adrian Rollini and his “hot fountain pen,” the forgotten Dudley Fosdick and his mellophone. Thanks to Albert Haim for the Melody Maker pages below — now it can be told! And even more here about the hot fountain pen from Sandy Brown’s website. A fine explanation of the mellophone can be found here. But the most engrossing reading on the subject can be found in the Nichols Jazz Oracle notes — a three-page essay by Phil Melick, witty and informed, on Dudley Fosdick (whose first recorded solo on the instrument is on the 1924 Ted Weems record of BIG BOY) and the mellophone itself. Incidentally, the Incredible Shrinking Orchestra and the piano-drum duet make sense in retrospect as brief interludes enabling Rollini to leave his bass saxophone and approach the microphone alongside Fosdick. And unlike the 1928 recording of BASIN STREET BLUES featuring Louis, Earl, and Zutty, no one stumbles audibly on the way. This record of ROSES OF PICARDY is a joy. Perhaps the musicians thought of it as an end-of-session romp: “We have a little time. Let’s jam PICARDY, and do a whole chorus on your pen and your ‘phone. OK?” But that forty-second conversation between two unexpected jazz horns, played by two masters, resonates long after the performance is over. Woe and alas that there wasn’t a Rollini-Fosdick Quintet under contract to Brunswick. But I could live comfortably in the universe of those forty seconds. ‘Tis the chorus that I keep in my heart. Thanks also to Messrs. Riccardi and Sammut, whose posts provide the inspiration for this one.